I think they are jaspers. But which kind, I don't know. There are tons of them with sometime quaint names. 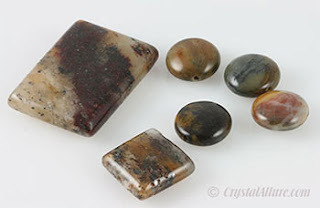 I think the square and rectangle is some kind of jasper as well...but the rounds I think might be something else possibly an agate as they don't seem to have the same variegation patterns...but I'm not an expert, just my guess! Thanks for stopping by Heather! Yes, I do agree with both you and Pearl. I think they are jaspers too and I do question the smaller round ones...they do appear slightly different, just not sure what they are. Thanks for your suggestions.